I got a bit fed up with studying the head and face. So, while working on this portrait and head structure stuff I also took some breaks and played around with ink. Generally I find looking at people’s eyes difficult which made the head structure stuff quite demanding. It’s probably because of my autism but what I loose in some areas of art I gain in others so I don’t mind. At least I understand what is difficult and why. As a result I often try to avoid portraits and faces. I can do them from photographs, they just wear me out really quickly. Here’s a link to a full on front facing portrait I managed recently where I just screwed up my courage and went for it. (Mud Man Link). In paintings generally, when I can, I often hide the eyes and if I can’t do that I often have my subjects with their eyes closed or at least not looking at the viewer. e.g. Faces in real life are a different matter all together. When I sketched some friends last week I found myself avoiding drawing their faces until the end and then putting in simplified features so that I didn’t have to look at their faces for more than a glance. It was so much harder than looking at a photograph that it really shook me. I guess a photograph is really just tone and colour in certain patterns whereas people sitting there are real, whole and alive. And then a bit more doodling while thinking about this really enormous prime number (2^74 201 281 -1) which was discovered on 4th January 2018! Finally I drew a tiny little woodlouse from reference. It was bliss. This week I concentrated on the muscle structures in the head and neck. Again I did some careful pencil drawings. I found this exercise revealed much more of the final head shape than the bone structure exercise did. I guess that makes sense since the muscles attach to the bones and build on the bone shape. They were very relaxing drawings to make. This week I did a careful drawing of a human skull from the front and from the side. I think this might give me the basics for why heads look like they do. I’ll look at the muscle structure next week. Having worked on a gouache portrait last week I decided to really look into how the human head is shaped. I tend to learn really well from reading books and then trying out what the book suggests. I looked at all the anatomy books I had but none of them gave me a quick and dirty basic shape. 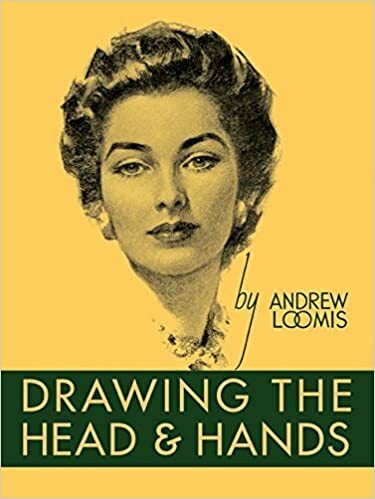 So I ordered a book on facial proportions by a guy called Andrew Loomis. This is the basic starting Loomis construction. Next I learned to create a “planar head” which is a basic head shape made up of flat surfaces, like a polygon map for a computer game. Following what I learned from the BB8 painting when I ran it through some photoshop filters, I decided to “push the envelope” with this next portrait. It is inspired by one of Kevin Millet‘s brilliant photographs of the model Matt Blouin in his series called “L’Homme D’Argent”. It was a beautifully lit photograph of Matt with paint or mud or some other dark material all over his face and upper shoulders. It had this contrast in the picture between a wild man and a bookish man. 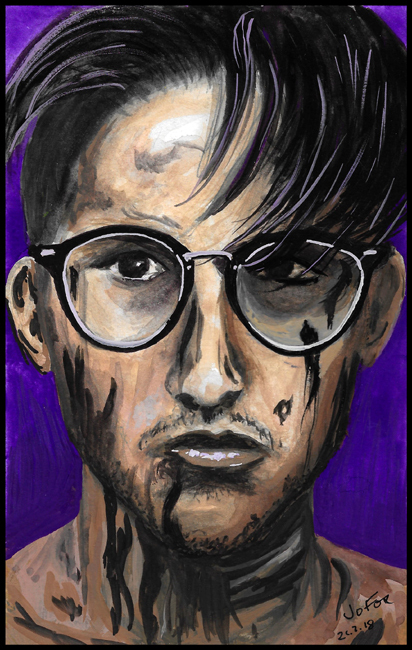 Th model’s glasses make him studeous but the mud pushes that image right into wildman territory. It’s a great photo. I tried really hard not to worry about the details too much as I wanted the final effect as a whole to work rather than each pencil line. I am pleased with this because it has in it, for me, the free feeling I was reaching for. I used my canon Powershot camera to photograph the painting as I worked on it but, although it was fine for the browns and creams of the early stages it would not pick up the purple background – at all. I don’t know if it’s failing or broken but everything came out blue and not even french ultramarine but more cerulean blue. So I had to scan the final painting to get anything like my original colours. PS: If you want to see Kevin’s original photography you can look it up with the search terms “Kevin Millet” and “L’Homme D’Argent”. I’m no longer linking to other websites as there is a possibility of a new European law which will not allow someone to freely link to another artist’s work without legal issues. I would encourage you to have a look though as his photographs are amazing.